Following the successful first Berlin Energy Transition Dialogue in March 2015, the German Federal Government continues the international exchange on the Energiewende. The global trend to switch to a sustainable, reliable and cost-effective renewable energy supply creates new opportunities for future international cooperation. 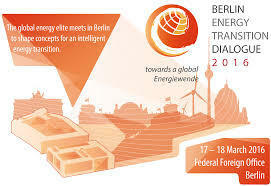 To this end, the second Berlin Energy Transition Dialogue will be organized at the Federal Foreign Office in Berlin, Germany. Further information will be made available on this website as the event draws closer. Meanwhile, feel free to catch some impressions from the 2015 Dialogue, including the official videos and photos. To invite the world to the Berlin Energy Transition Dialogue 2016 and to promote the international dialogue on the energy transition, a GREEN ENERGIEWENDE SOFA is travelling around the world initiating discussions at several international meetings and conferences before ending up in Berlin at the start of the next Dialogue.